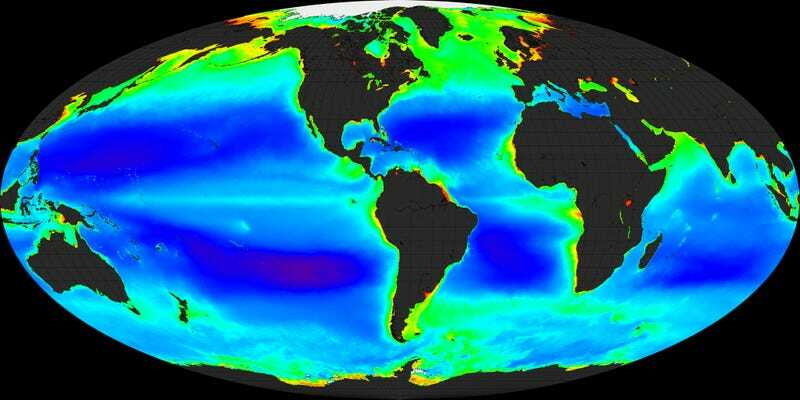 Global chlorophyll concentrations in Earth’s oceans as determined by satellites. Climate change is turning the planet into something alien. As a striking case in point, a new study predicts that the surface color of at least half of the world’s oceans will change by the end of the 21st century. This alchemy will be driven by phytoplankton; surface-drifting, sunlight-gobbling microbes that form the base of marine food chains. With rising greenhouse gas emissions causing the oceans to get warmer and more acidic, these critters’ numbers will change depending on if their living quarters get more or less habitable. That will alter the ability of the surface of the ocean to absorb and reflect sunlight, changing its apparent color. The new study, published Monday in Nature Communications, predicts subtropical seas will become bluer, representing a decreasing biomass of phytoplankton in response to an increasingly hostile environment in terms of pH and temperature. Waters nearer the Arctic and Antarctic may turn a little greener as conditions become slightly more amiable. Various satellites have been monitoring the changing colors of the ocean for around two decades now to keep an eye on the health of the seas. These raw satellite measurements are thrown into computer algorithms, which then churn out estimates of chlorophyll, a sunlight-drinking pigment found in green phytoplankton and plants. A problem with this method is that it isn’t just climate change that causes chlorophyll to change. Natural variations, such as those caused by the El Niño/La Niña cycle, can also affect the amount of green pigment in the sea. That’s why the new research, led by the MIT Joint Program on the Science and Policy of Global Change, decided to eschew them, hoping instead to precisely isolate and detect climate change signals. The researchers’ new model takes into account an array of factors, from phytoplankton food sources to their growth rates, while also considering ocean circulation patterns. This produces novel forecasts of ocean surface colors in the days to come, which can be directly attributed to future phytoplankton populations. “Our model can now suggest what such satellites might see in the future world,” Stephanie Dutkiewicz, lead author of the new study and a principal research scientist at MIT’s Department of Earth, Atmospheric, and Planetary Sciences, told Earther. The model doesn’t just pick up on total abundance changes. Different palettes of blue and green reveal “something about the combination of different types of phytoplankton in the water as well,” said Dutkiewicz. The authors explain that under a business-as-usual scenario featuring an average global sea surface temperature rise of 3 degrees Celsius by 2100, half of the world’s oceans will undergo a complex change in surface color. These color shifts will unlikely be perceivable by the human eye, but satellites will be able to pick up on the long-term trends. Henri Drake, a doctoral researcher in physical oceanography at the MIT/Woods Hole Oceanographic Institute who wasn’t involved in the work, noted that previous models have suggested these color changes would be noticeable only by the end of the century. However, this new model predicts that such color changes should be visible as early as the 2050s. Phytoplankton are the foundation of marine food webs. Climate change will cause these foundations to dramatically shift all over the plant, which could have major consequences for species found on the higher echelons of these delicate webs. As scientists continue to work those consequences out, the fact that the oceans are changing color serves as a reminder of just how quickly our increasingly unnatural world is being transformed.